Fair. 085331392X Please allow 4-14 business days for Standard shipping, within the US. Thank you for supporting our small, family-owned business! Fine. 085331392X Please allow 4-14 business days for Standard shipping, within the US. Thank you for supporting our small, family-owned business! Very Good in Very Good jacket. Volume 4. First published in 1977, this copy is a second impression from 1991 (hardback). 4to (30cm by 25cm), 64pp. 198pp plates. Original black cloth, dustwrapper. The book and the dustwrapper are in as-new condition. ISBN 085331392X. VG: in very good condition with dust jacket. 300mm x 240mm (12" x 9"). 64pp + 198 plates. B/w plates. 4to, 64pp [text] and [catalogue] + 198pp [black-and-white plates], Hardback with Dust Jacket both as New. PLEASE NOTE THAT THE BOOK WEIGHS 1.9 KILOS WITH PACKING. Near Fine in Very Good dust jacket. 085331392x. Boldly inscribed by Moore on the front endpaper. 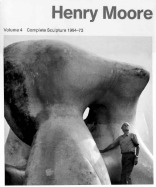 ; Henry Moore Complete Sculpture; 11.79 X 9.75 X 0.94 inches; 198 pages; Signed by Artist.